Although the December Uprising ended in less than 10 days, with the arrest of thousands and the intensification of repression and military rule in more than 80 cities, it was the beginning of a new era in the struggles of the lower middle class and the working class. 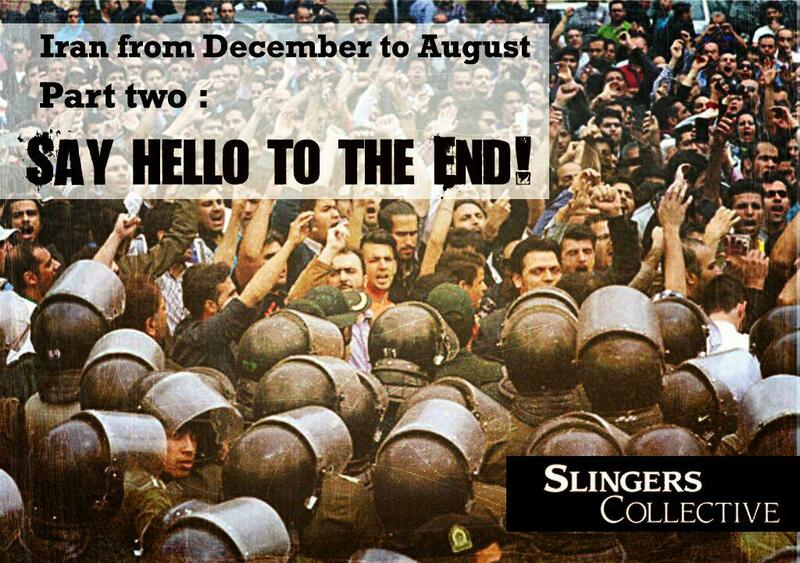 Student guild councils that suffered great costs and more than ninety of their present and former members were arrested during the uprising in December in Tehran, Tabriz and several other cities, have been able to recover parts of their damaged forces, and this was unique on its own. In previous experiences, including the arrest of a large number of leftist students in December 2007, long periods of silence and inactivity had prevailed upon many universities. This time, although some of the detained students have faced heavy prison sentences,guild councils have more or less resumed their activities and their influence has spread over the universities more than before. Exactly on the day that many cities in Iran faced martial law, workers of HaftTappeh Company –and several days later, the workers of Hepco Company in Arak- held protest rallies and announ3ced that they will pursue their labor rights. These two rallies resulted in tearing apart the terrorizing atmosphere amongst the industrial centers and labor fights that the government had expected to hold sway as are sult of the intensive suppression and martial law, much sooner than expected. Meanwhile, the consistent clashes of Ahwaz Steel workers,and the truck drivers’ and the railroad workers’ strikes have given new impetus to the fights of the working class. Strikes that are often organized by invisible regulatory circles, sometimes lead to the formation of new institutions, such as the Railway Workers’ Coordination Council. After December, the number of strikes and labor rallies has grown unprecedentedly, with an average of four strike sand rallies per day. Although the government has repeatedly tried top revent the enhancement of this movement by summoning and arresting well-known figures of the labor protests, but the arrests have sometimes resulted in the contrary. For example, when twenty-five Haft Tappeh Sugarcane workers were arrested overnight, the continuation of the strikes was announced by workers and the demand for the release of prisoners was added to their former demands. The arrested strikers were released after a few days. (At present, HaftTappeh Sugarcane worker Ismael Bakhshi and Sepideh Gholian, a young journalist, are still under arrest. Moslem Armand, Mohammad Khani farand Hassan Fazeli have been released last week). Or when more than 10Ahwaz Steel workers were arrested after a sit-In in the Department of Justice, all the detainees were freed. This added to Workers’ and Labor Movement’s fighting power, and they felt empowered by the government’s show of weakness and withdrawal. The teachers’ movement has also become more widespread than before and has organized numerous protest rallies and strikes. As a result of the December Uprising the “Iranian Teachers’ trade Association”–the main teachers union- has found a more important role between the teachers and is better organized than before. Continuation of teachers’ struggles has also led to the formation of semi-secret organizations such as “Equality seeking Teachers Association”,which evidently has a leftist orientation and seems to have gained considerable influence among teachers. Only one day before the Mashhad demonstrations on the 28thof December, a woman went on top of a utility box, on the Enghelab(Revolution) street, one of the main streets of the capital, and tied her head scarf to a stick and waved it, in order to show her protest against the Compulsory Hijab Law. Although the woman was quickly arrested and disappeared for several weeks and eventually tracked down in one of the Islamic Republic’s prisons, the energy released from the December Uprising has revealed the weakness of the government and added to the general defiance. Shortly after the December rallies, several women repeated this protest movement. Between January and March, dozens of women in different cities, and mostly in Tehran, continued the protest movement of the Girls of Enghelab Street in the same way. But the lack of organization in this movement, which was considered by the liberal and moderate analysts as its strength, and the expropriation of its voice by the faces of”media feminism” –mostly right-wing feminists who live abroad, claiming the leadership of this In existent “campaign”-disabled the protest movement to continue any further with this form.However, the struggle against compulsory veil in other forms has become a daily occurrence. Moreover, Iran’s women movement took another long step forward after the December days. On March 8th,in response to a demonstration call from a group of leftist feminist women a rally was held in front of the Ministry of Labor, whose clear feature was the Class specified objective of its pro-claimers and the reflection of struggles of working class and dispossessed women. On the other hand, women’s gathering in front of the Ministry of Labor, after more than a decade of oppression and silence, was the first women’s gathering on the streets. The rally was brutally suppressed as security and police officers beat up protesting women and men, and arrested dozens. The detainees, were eventually released after a few days and were cleared of all charges after a few months.These events indicated further for women the government’s weakness and retreat. The water crisis was another dilemma that challenged other parts of society after December. Uncontrolled and poorly planned dam constructions, which began during the presidency of Hashemi Rafsanjani, exporting water to neighboring countries and the extraction of water for use in the industries caused water shortages and droughts, especially in the southern and central provinces of Iran. The farmers’ movement started from the villages of the central province of Isfahan and spread out to other provinces. Farmers have repeatedly demonstrated in the streets, fought on the fields or in villages against military forces and in one them memorable moments of their protest movement, they occupied rows of the Friday Prayer and turned their backs on the Imam. Friday prayer is one of the most ideological rites of the government. A collective prayer held every Friday under a Friday Prayer Imam’s leadership,who is directly appointed by the supreme leader, representing him in the city. An institution called the “Friday Imams policy council”, chaired by the supreme leader, every week sets out important issues that should be promoted by the Friday prayer Imams in this ritual. The water crisis also led to occasional bloody conflicts in the southern cities of the country, especially in Khuzestan province. This Province, which is the main province providing oil in Iran and is located along the Karun River, has been struggling with the drought crisis and air and water pollution for years. In the clashes that took place in July, which radically expanded, unverifiable reports of armed conflicts between protesters and government agents in some areas have been heard. The immediate impact of the December Uprising was the boost of public protests. Protesters were not passive anymore against the aggression’s of the security forces, but they rather launched quick offensives against the suppression. Many examples of public protests in the months after December 2017 showed that the issues of the masses with the justified self-defense of themselves and the attack on the ruling repression system had been resolved. For example, in May, people in a small and underprivileged city of Kazerun in Fars province, one of the central provinces of Iran, came to the streets in protest against the decision of the Parliament to separate some parts of the city.The troops targeted the demonstrators with direct shots and killed at least three people. In return, protesters occupied the police headquarters and burned police cars and buildings. The government wasforced to withdraw and to halt the division of Kazerun. Shortly thereafter, people of Chenar Shahijan, one of Kazerun’s districts,which was supposed to be separated from Kazerun and turn into a county along with several other small districts, came to the streets in protest against the cessation of the Kazerun’s division; closed the main roads and stormed the office of the Friday prayer Imam.Despite the serious contradiction between the demands of Kazerun’s residents and the people of Chenar Shahijan, the driving force of both of these protests was poverty and deprivation that was imposed upon them. While many analysts were expecting the people to line up against each other, but both in Kazerun and in Chenar Shahijan, it was just the public offices, which were being under siege. The shockwave of US’ withdrawal from the JCPOA and the sudden increase in the Dollar’s and Euro’s value against Real, finally set off a reaction amongst the capital’s residents. In June, a strike took place in Tehran’s bazaar, and thereafter, a demonstration was held that ended with a clash with armed forces. Even though the strike was held in the bazaar, the main body of the force that struggled with the military on the streets were young retailers and bazaar workers such as busboys, porters, bike deliverers, and also vendors. Two months earlier, Bazaar in Baneh, a Kurdish town at the western Border of Iran, went on strike for several weeks to protest a ban on importing goods through the Kurdish border. It is important to illustrate the nature of these struggles as it becomes apparent, that the general struggle and mass protests, which often possess class content, are constantly expanding, even though they still lack a class-oriented political expression, but after December Uprising and its massive and bloody repression, it has not been stopped. In August, Iran saw another wave of protests, which has hit more than 10cities for several days. This time the uprising began in Isfahan, an industrial city in central Iran. On July 31st,truck drivers began the second round of their strikes. As a result,the Isfahan bazaar was closed and it turned out many more people to join the demonstrations. People living in deprived and marginalized neighborhoods also joined the rally after several hours and an anticipated fight against the security and law enforcement officers began. With continuation of the protests on August 1st,the Shapour-e Jadid neighborhood, one of the poorest workers’ districts in Isfahan, became the main focus center of the conflict while the uprising also reached other cities. People, who were exhausted by uncontrollable rising prices, came to the streets of Karaj, Shiraz, Rasht, Mashhad, Kazerun and several other cities. The clashes, which lasted until August 3rdand continued as scattered rallies until August 4th,were fiercest in the poorest neighborhoods of Gohardasht and Eshtehard in Karaj and in the city of Kazerun, in addition to the Shapur-e Jadid neighborhood of Isfahan. The August Uprising has now ended due to vast and violent crackdowns; and as in the past, there are no reliable reports on the number of killed or detained protesters. Local sources reported that one of the organizers of the protests in Isfahan’s Shapur-e Jadid district, who was summoned to a meeting with the Employers’ Union and representatives of the security apparatus, was killed. Although the unrest’s have subsided for now, the regime’s crisis is only mounting. Unconfirmed reports point to some government administrators and leading capitalists, leaving the country, as well as some of them being arrested while trying to cross the border. However, the reports have not been confirmed, and Parliament is discussing a plan to stop government executives, who have dual nationalities (allowed under Iranian law) from leaving the country. While structural corruption and all types of embezzlement have swept the whole body of the state,the state is looking for victims to blame them for the turbulent economic situation and the growing spread of poverty and misery. Almost at the same time as Valiollah Seif’s dismissal (the head of Iran’s Central Bank), which was sold as a “resignation”and around the time that rumors about him leaving the country were denied, Ahmad Araghchi, former foreign currency deputy to Seif, got arrested with a court order. The Parliament also impeached and sacked Ali Rabiei, the Labor Minister. He mentioned in his impeachment hearing: “I’m aware that I’m going to be sacrificed”. All of this happened, while Spokesman of Rouhani’s administration (who himself has been sacked) addressed the possibility of some changes in government’s economic team. Although the government is trying to attribute the growing public protests to adversaries and to the opposing parties in exile, the organizing methods of these protests are very simple. Each demonstration call that can find a way into the intertwined network of telegram channels and labor groups rapidly spread out and maintain very practical demands. The government’s attempts to dismantle the telegram channels, by filtering, have so far been unsuccessful. Today many people in Iran believe that the government is collapsing, although all of them may not be happy with this collapse. The question remains whether Iran’s regime will be overthrown? If so,which forces will have the chance to replace it? Which roles will be played by the imperialist states? And how much will the up coming changes benefit the workers and dispossessed? These are all questions, which will be answered with each wave of uprisings.However, what may be understood with certainty is that the Iranianregime’s hegemony is cracking being overthrown in the hearts and minds of Iran’s most marginalized.